Syd's, trading from this spot since 1919. 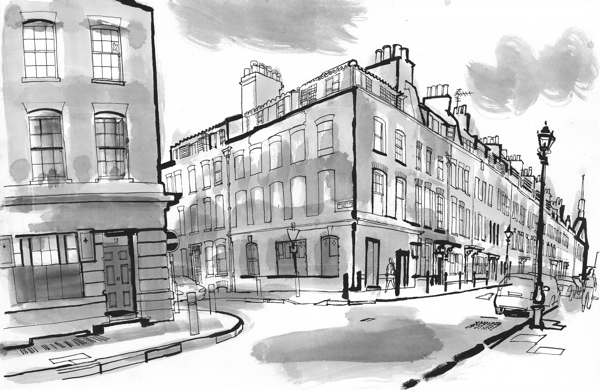 Fournier Street, as sketched by Lucinda Rogers. Spitalfields has one of the most diverse populations in the world. Market traders, fashion students, Bengal curry merchants, street artists, City traders, celebrities, beigel bakers, antique dealers, Ripper hunters...the list goes on. Among the quarter's most remarkable inhabitants, although he'd never admit it, is The Gentle Author. Over the past couple of years, our pseudonymous guide has written a blog post a day about the denizens of his chosen home. Now, a new book compiles over 100 of the very best articles from Spitalfields Life. Most of the Gentle Author's pen portraits deal with seemingly everyday people: the grocer at the end of the street, the cafe proprietor, the publican, the window cleaner, the frustrated pigeon fancier. But each has a remarkable tale to tell. Gardners' at 149 Commercial Street sells paper bags. You could walk past 100 times and never notice it. Inside, however, you'll meet the charismatic Paul Gardner, whose family have traded from the same premises since 1870. 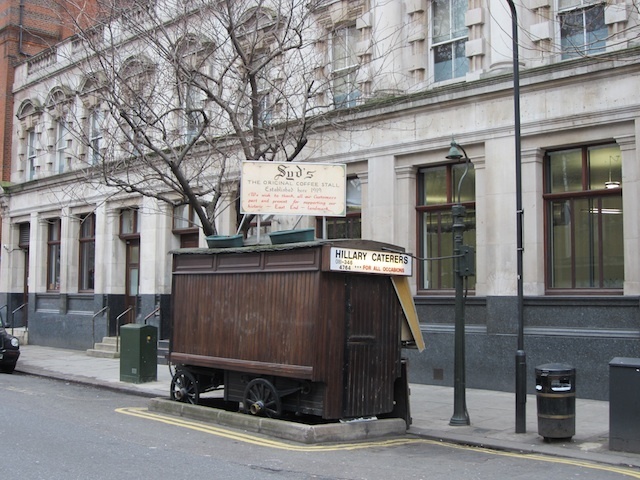 A few blocks away in Calvert Avenue you'll spy Syd's, a refreshment vendor dealing from a wooden stall which has been on the same patch since 1919...you can even see the original street cobbles beneath the wagon. Then there's Charlie Burns. 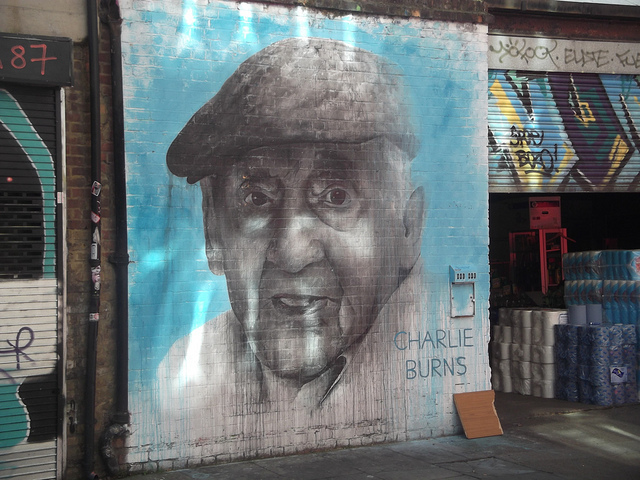 You might have seen the mural dedicated to the 96-year-old former boxing promoter in Bacon Street (shown above). But did you ever notice Charlie staring right back at you from the anonymous car parked alongside? He sits there all day, every day, watching the passers-by, who include a sizeable contingent of mural photographers who don't realise the genuine article is sat yards away. This is just to scratch the surface. Much like 'Londoners', Craig Taylor's exceptional insight into the capital, Spitalfields Life mines for awe in the most unlikely places — the everyday people who, in their own quiet, often invisible way, shape the neighbourhood. Regular readers of the blog won't find much in the way of new content save for a couple of guided walks at the end. However, these wonderful stories shine anew in an attractive, beautifully illustrated book format. We can't recommend it highly enough. Finally, Spitalfields Life is much more than a compendium of local characters. It invites musings about the changing identity of the area, and particularly the commercial make-up of Spitalfields. With the loss of the fruit and vegetable market, the encroachment of City office space and, latterly, the implantation of BoxPark, this is a community in flux. 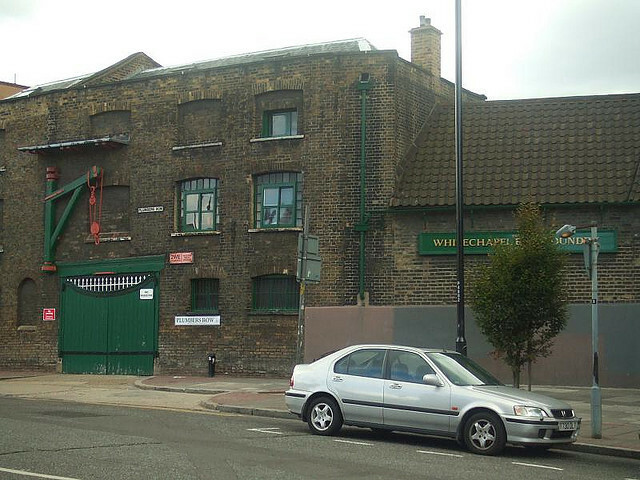 How long treasured family businesses such as Gardners', Syd's and even the Whitechapel Bell Foundry can last in this changing milieu is anyone's guess. But then Spitalfields has always been a fluid place. The Gentle Author surely has enough material to last a lifetime. 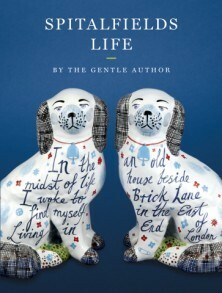 Spitalfields Life is out 1 March from Saltyard Books. Buy here.